Participants receive in-depth knowledge about MACH and PowerMICE Layer 3 functionality. This includes installation, commissioning, and supervision. The functions and deployment possibilities of the products are taught in individual theory blocks, followed by practical exercises. System Engineers, Network Designers and Support Technicians. Previous attendance of CT1, CT2, CT3 and CP1 courses OR passing grade on HiES, HiNP, HiRP and HiRS exams is required. The participant should bring a laptop with Ethernet connection and an operating system CD. Administrator rights are required. This course prepares the attendee for the HiBS: Hirschmann Industrial Backbone Specialist certification, which is valid for one year. The exam is included as part of the course, however the course is not required to take the exam and become certified. The cost to take the exam only is $100 – click here for further instructions. For more information, contact: Derek Washington, 765.983.5735, derek.washington@belden.com. Learn the benefits of plug-and-produce systems. 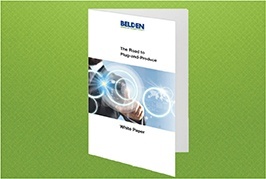 Download this white paper!